2. Remove snap ring and take off clutch K 1 and shims. 1. Lubricate and install axial bearing and split needle bearing. 1. 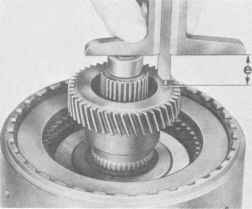 Slide Special Tool 9307 on to the output shaft and position the entire gear assembly upright carefully. 2, Install sun gear and thrust washer. Coated side of thrust washer faces sun gear. 3, Heat ball bearing to about 120° C and press on with a suitable piece of pipe. 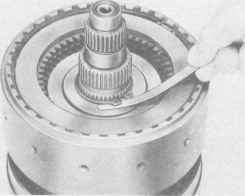 4, Install hollow shaft in one-way clutch that shaft turns in direction of arrow. 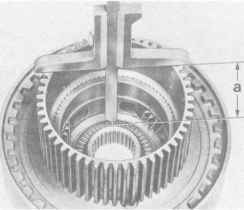 After installation of hollow shaft it must lock when turned in opposite direction of arrow. 5. Lubricate thrust washer and needle bearing slightly and slide them on the intermediate shaft. 6. 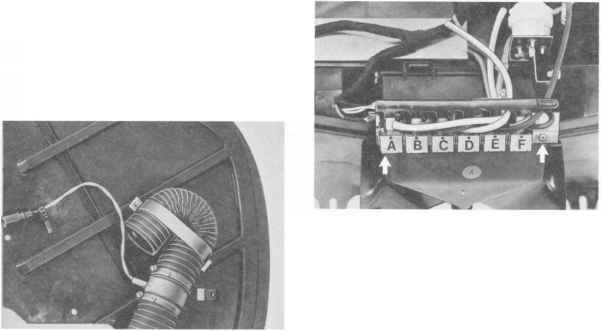 Install intermediate shaft in clutch K 2, turning slightly that spline of inner plate carrier engages in inner plates. 9. 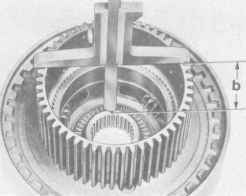 Install radial bearing between hollow shaft and support flange. 10. Install oil distribution sleeve in support flange K 2 so far carefully, that both oil seals engage in support flange. 7. 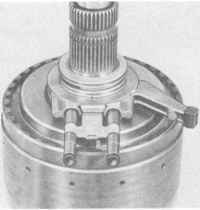 Install output shaft with needle bearing in brake band drum. 8, Install Special Tool 9307 on output shaft and position preassembled gear assembly upright carefully. 11. Install clutch K 1 carefully, making sure that oil seals engage properly. 12. Check axial play of hollow shaft. Install circlip without shims and check play with a feeler gauge. Install shims to adjust play to specified value of 0. 3 to 0. 4 mm. 13. Check axial play of sun gear. Lubricate and install axial bearing in planet gear carrier. Measure distance "a" from face of inner plate carrier to roller of axial bearing with a depth gauge. Measure distance "b" from face of inner plate carrier to shoulder of planet gear carrier. Measure distance "d" from face of intermediate shaft to shoulder of intermediate shaft. Install sun gear and needle bearing. Measure distance "e" from face of intermediate shaft to face of sun gear. 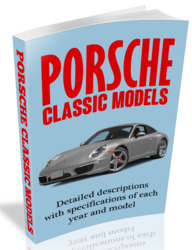 Adjust play to specified value of 0. 2 to 0. 3 mm by installing shims underneath the axial bearing. 14. Install planet gear carrier, turning it back and forth to have inner plate carrier engage in spline of plates. 15. 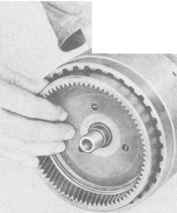 Install radial bearing and input shaft. 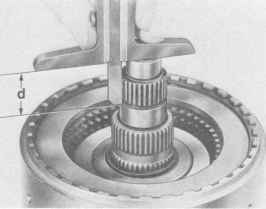 16, Install and attach lubricating pressure ring in groove of input shaft.